Active in Ferrara, 1447, died 1456, Italian painter. He was court painter to Borso dEste, Duke of Ferrara, and, with Cosimo Tura, decorated the Duke's studiolo at the Villa Belfiore (destroyed) from 1447 (start under Lionello). It is said, that the iconographic programme was provided by Guarino da Verona. Cyriac of Ancona, a Renaissance merchant who loved to travel and left us many notes from his journeys throughout the Mediterranean area, saw in 1449 two finished paintings of Clio and Melpomene (both untraced) in Angelo's workshop, probably destined for the studiolo. No work by Angelo has been identified. Active ca. 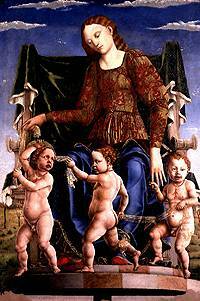 1415 - 1464, "Ceres enthroned" is the only known work. Michele came from Pannonia, the Western part of Hungary. From 1415 onward he seems to have worked at Ferrara and is mentioned in the court records as Michele Ongaro as one of the court painters. Probably "Ceres" was intended to decorate the "studiolo" in Belfiore Castle and may have been part of the decorative scheme executed between 1450 and 1460, which included a similar composition depicting an enthroned allegorical figure by Cosme Tura, now in the National Gallery in London. The general style of his work indicates a strong link with the School of Ferrara. The earliest Ferrarese master whose works survive in any appreciable quality is Antonio Alberti or Antonius de Ferraria, under Marquis Niccolo III. While this 'master' is described by Vasari as a pupil of Agnolo Gaddi, Edmund Garrett Gardner says this is impossible. Antonio's dated works in the 1430s: Madonna and child dated 1433 in the chapel of the nuns of Sant Antoni inPolesine at Ferarra. 1437; Annunciation, Visitation and Adoration of the Magi with various Saints discovered at Talamello, a small place in the province of Urbino and Pesasro. In the Pinateca of Urbino, the alterpiece by from the church of San Bernadino, signed and dated 1439. 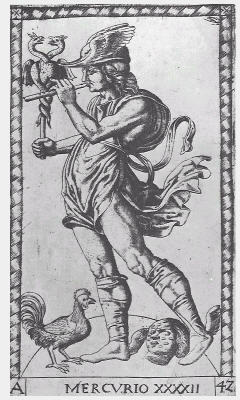 Influences cited included Gentile da Fabriano. 1438: Marquis Niccolo commissioned Antonia to decorate the palace known as Paradiso with frescos of Christ in Paradise and the assembling of the Council of Ferarra. On the ground floor, there are reamins of a fresco which is either an allegory of or scene from Carolinian or Arthurian romance, depicting of a siege of a tower, from the battlements of which a woman in red, apparantly a prisoner is leaning; but there is no grounds to assign this to Antonia. The painter seems to have passed most of his life in Urbino, where he was still living in 1464, when he gave his daughter Calliope in marriage to a certain Bartolommeo Vito ordi Vite, where she became the mother of the most famous artist Timoteo Viti. Other historians include the frescos of the Capella Bolognini in San Petronio at Bologna and the death of St. Catherine of Siena in the pinateco of Ferrara to this painter (but Edmund G. Gardner does not agree). The official court painter in 1447 was Angelo Macanini da Siena and held the same position under Borso until 1456. None of Angelo's works can now be identified, nor any trace of Sienese influence can be descerned in the productions of the subsequent Ferrarrese school (Mari's note: Touhy, who authored Herculean Ferrarra in 2004, seems to agree on biographical details of E.Garrett Gardner, but does not seem to refer to a Ferrarese School of Painting in his research of Ferarra). Edmund Garrett Gardner also mentions precursors to the "Ferrara School" that includes Giovanni da Oriolo and Bona da Ferrarra, as imitators of Pisanello. Cristoforo and the Bolognese in 1404-- this confusion may refer to two Galassos. Gardner suggests one is Galasso di Matteo Piva who worked for the Ferarrese court from 1449 to 1453. The other is the author of the Trinita signed with a double G in the pinateca at Ferrara and the Adoration of the Magi. Other contemporaries with Galasso di Matteo Piva was Michele Ongara, a Hungarian who worked in Ferarra during the forties and fifties and was dead as of July 28, 1464. Another contemporary was the nun Sour Carterina Vigri or Saint Catherine of Bologna who died in 1463. The composition is dominated by the blazing figure of Vesta on her light chariot; a glowing colour that is toned down and finally drawoned in the pellucid clarity of the atmosphere, in the azure transparancy of the landscape and of the air. There are very few of the typical Ferrarese fantastic and fairylike elements in the peaceful expanse of this plain gently sloping from green hills delimitings its far horizon, in which silvery streams slowly wind their ways, as in Piero's pictures. Like in no other Schifanioa figurations, the composition is wholly centered in the figure of Vesta, the Vestals --now the far greater part cancelled-- stand around her: there are few figures in the landscape broadening all around. Proportions, relations, lights and tones are entirely different from those of the other fields, and more generally speaking, from those to be found in the works of all the greater artists of Ferarra, being much closer to the manner of Piero della Francesca.I do not think I would be very far from the truth when putting the composition together with the works that Longhi and Venturi groupd under the name of Galasso, who should be a painter of strong personality, and a very careful student of Piero, acting round 1460, and to whom they attribute a group of ((Muses)) at Budapest and the ((Autumn)) at Berlin. Were this fresco to be really attributed to same artist who worked with Tura and others at the little workshop at Belfiore, it would mean that we find him again, seven or eight years later, more deeply entered into Ferrarese atmosphere, but still in a position of great originality and independence with respect to Tura and other masters, an originality which might have had a future importance of the art of Ercole (Roberti). If the painter of this ((December)) is the same who did the ((Muses)) and the ((Autumn)) it would be, also, a confirmation of the fact that the Berlin ((Autumn)) is not work of Cossa's youth. The fact of there being found at Schifanioia the _expression of the mature art of Cossa on the east wall, and this month of December, which could be given to Cossa only on condition of attributing it to a much earlier stage of his activity, adds strength to the hypothesis that we are confronted by two different persons, not by two periods in the development of the same personality. Also, both the ((Autumn)) and the ((Muses)) are better explained if considered as the direct forerunners of a work such as the Schifanoia composition, if we attribute these to Cossa. It is, moreover, very interesting, also in relation to the art of Cossa and Ercole, to see this artist (or at least this manner) still in full activity around 1470 almost as if a link with the art of Piero, one of the noblest components, together with the Padua and Northern-Flemish manners, of the Ferarra pictorial tradition, had not yet been definitely broken.